defendants, are also discussed. Each chapter includes practice tips to help paralegals become proficient in the practice of workers' compensation law, as well as references to find the most up-to-date information regarding various aspects of workers' compensation practice. Sample documents are included to illustrate the kinds of documents paralegals may draft in a typical private law practice. Workers' Compensation Practice for Paralegals is unique because it is written specifically for paralegals by an attorney/paralegal team with a combination of over thirty years of practice in workers' compensation law. In addition, both authors have experience teaching law students and paralegals in college settings. 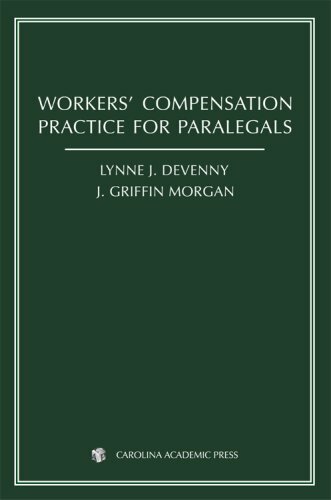 Recognizing that there are excellent state-specific workers' compensation reference books for workers' compensation practitioners, this book is intended to guide and train paralegal students, paralegals and other legal professionals new to the practice of workers' compensation law. Straightforward and easy to read, it provides its readers with an overview of the essential skills necessary to perform substantive work on any workers' compensation case, as well as the tools to find the information they need to make a significant contribution to a workers' compensation practice, whether it be their own state-specific rules and forms, Medicare's current WCMSA requirements or medical references.